If you are not currently following the scrum framework, start with a pilot project. When selecting a pilot project, there are several factors to consider. Select a project with a strong product owner who has time to devote to the team. The product owner’s role will be to make key decisions that aid in the success of the project. Next, select team members who not only have technical aptitude but who are also transparent and open to change. Finally, select a project that is visible and important to the organization. If you select a project that is low-risk, it will discount the success of the project. It will also severely limit the amount of organizational learning and challenges that are needed to complete the larger more difficult projects. 2. Is Your PMO Involved with Agile? Organizations often ask, “If we transition to an Agile approach using the Scrum framework, do we still need a PMO?” The answer is yes! Organizations are achieving success by utilizing a combination of a PMO and an Agile framework. Per a recent report, 95 percent of Agile projects managed through a PMO were considered highly successful. 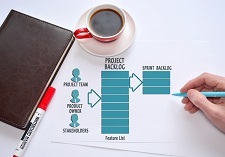 As organizations transition to Agile frameworks, it is important to highlight that project managers are not always good Scrum Masters; however, they are often excellent Product Owners. Product Owners prioritize what the team should work on to satisfy the needs of the users, stakeholders, and the team itself. PMOs must adapt to the mentality of people over processes. This does not mean that metrics and timelines do not need to be tracked, but they will be tracked in different ways. Tracking burndowns of how much work is remaining becomes much more important than the percentage of tasks completed. Additionally, focusing on ways to measure realized business value and customer needs and wants becomes essential in making smart product management decisions. 3. Have you Made the Shift to Feature Teams? Organizations are traditionally divided into component teams, which work on an individual component or layer of a product. However, as organizations transform to Agile frameworks, they will begin using feature teams: cross-functional teams composed of multi-skilled individuals who have a broad breadth of knowledge and depth in each skillset. Feature teams eliminate waste by reducing hand-offs and dependencies from one team to another. They also promote communication and reduce the risk of developing unnecessary functionality. 82 percent of Scrum teams are made of 4-9 team members, with 7 being the recommended number. If you are still using feature teams and don’t have the ability to make a drastic change across the organization, start small by putting together a cross functional team for a pilot project. 4. Are Your Agile Teams Distributed or Co-located? Do your teams sit together or are they distributed across multiple locations? It is considered a best practice for Agile teams to be co-located so that they can have clear, unobstructed communication. However, more than half of today's organizations have distributed Agile teams. If teams are distributed across offices, cities, states or countries, it creates additional challenges. Using technology to promote communication and respect between team members is essential. Try using video conferencing, instant messaging, email and telephone calls to help reduce communication challenges. On global teams, language, time zones, and cultural differences create additional complexities. Changes in the Agile development process, cultural education, and meeting times are often necessary adjustments to support the success of global teams. Keeping up with today's Agile trends helps you rapidly deliver quality products and services to your customers. As you understand how other organizations adopt Agile frameworks and concepts, use that to your advantage to continually improve your Agile maturity and achieve success in today's demanding marketplace.